When taken before a meal, fiber in wheatgrass regulates absorption of sugar and cholesterol from the food. This will prevent sudden rise of blood sugar level which is commonly experienced by diabetic patients after a meal. Wheatgrass contains high level of magnesium since this mineral is the central element in chlorophyll. Magnesium supplementation has been shown to improve insulin sensitivity. Based on current knowledge, magnesium repletion may play a role in delaying the onset of type 2 diabetes and potentially in warding off its devastating complications — cardiovascular disease, retinopathy, and nephropathy. Other nutrients in wheatgrass support the energy level and overall health of diabetics. Inflammation is the response of the body tissues to injury or irritation characterized by pain, swelling, redness and heat. Wheatgrass contains three powerful enzymes: Super Oxide Dismutase (SOD), P4D1 and D1G1, known for their anti-inflammatory action, addressing pain, heat and swelling. According to Dr. Kubota of the Science University of Tokyo, all three have anti-inflammatory action that is superior to aspirin. Inflammatory conditions may also be caused by infection. Chlorophyll, has antiseptic action that is proven to help the body fight infection. For gouty arthritis, wheatgrass diuretic and alkaline properties helps the body break down and eliminate uric acid. Wheatgrass is rich in magnesium since this is the core mineral found in every chlorophyll molecule. Magnesium has a relaxing and dilating effect on the blood vessels. It can relax constricted blood vessels and make them larger so that blood can flow freely and pressure on the walls of the blood vessels will be lessened. The antioxidants in wheatgrass prevent oxidation of cholesterol in the blood, or when the cholesterol sticks to the walls of the blood vessels. Antioxidants prevent cholesterol plaque formation or atherosclerosis. The fiber in wheatgrass also prevents absorption of cholesterol from the food, thus regulating cholesterol level in the blood. Fiber in wheatgrass works like a sponge in the digestive system, expanding its size by collecting water and producing bulk that stimulates the intestine to move (wave-like motion called peristalsis) and promote elimination of waste or bowel movement. The many enzymes found in wheatgrass help in faster digestion and breakdown of food in the stomach, which also assist in promoting bowel movement. Years ago, wheatgrass has been given to patients with iron deficiencies and proved to be effective in restoring the blood to normal. Chlorophyll in wheatgrass rebuilds the bloodstream. More recent research indicates that some porphyrins (ringed structures in chlorophyll) stimulate the formation of the protein portion of the hemoglobin molecule. This explains the effect of chlorophyll in blood production. 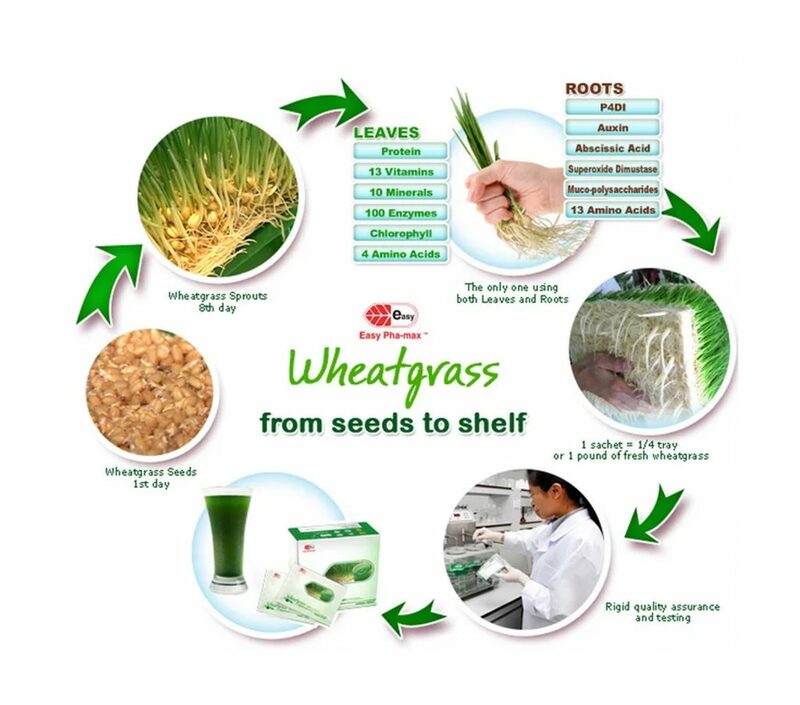 Other than chlorophyll, iron, niacin (B3), cyanocobalamin (B12), folic acid, copper, potassium and protein in wheatgrass, are all involved in healthy red blood cell production, making wheatgrass an excellent remedy for anemia and other blood disorders. Wheatgrass can heal bad skin conditions, minor and severe bed sores, diabetic wounds and burns. Applied topically (mix Easy Pha-max wheatgrass tablet with small amount of water and make into paste), wheatgrass has drying effect, lessens odor of infected wounds and stimulates tissue formation particularly for burns. Some dentists even suggest to their patients to gargle wheatgrass for 5 minutes after tooth extraction to prevent infection and for faster healing. Nutrients in wheatgrass has the ability to penetrate skin especially gum tissues. Chlorophyll is responsible for the antiseptic effect of wheatgrass. It kills bacteria, virus and other infection causing microorganisms through oxygenation. Its anti-inflammatory enzymes P4D1, D1G1 and Super Oxide Dismutase (SOD) help tame inflammation characterized by redness, swelling and heat. Wheatgrass also supplies nutrients needed for cell growth and healing like Vitamin C, E, provitamin A and amino acids. The enzymes P4D1 and Abscissic Acid (ABA), both found in Easy Pha-max wheatgrass, strip cancer cells’ protective covering so that our body’s immune system can attack and easily destroy them. According to some studies, abscissic acid is a formidable anti-cancer agent that, even in small amounts, it’s deadly against any form of cancer. Numerous health problems were proven to be alleviated by simply consuming wheatgrass. Other enzymes and amino acids also found in wheatgrass help with digestion, lower blood pressure, break down cancer cells, aid the liver and improve the immune system. Cancer cells cannot thrive in an alkaline and well-oxygenated environment. As such, wheatgrass is a powerful food for cancer patients since it helps provide an alkaline environment to the cells while chlorophyll oxygenates the body. Antioxidants, e.g. SOD, Vitamins C, E, bioflavonoids, carotenoids and other phytochemicals and enzymes, are also abundant in wheatgrass. These prevent cell damage and mutation that may lead to cancer or hasten spread of cancer cells in the body. In fact, enzymes and amino acids in wheatgrass have been shown to deactivate the carcinogenic benzopyrene found in charcoal broiled meat and smoke fish. Wheatgrass also contains B17 (laetrile), which is effective in fighting some cancers and is commonly used by alternative doctors nowadays. Chlorophyll has protective and regenerating effect on the liver. Other than the hundred types of enzymes that wheatgrass supplies (exogenous enzymes which means from outside source), the indole part of the chlorophyll supports production of enzymes by the body (endogenous). These enzymes detoxify carcinogenic substances that can cause liver cancer. The liver also uses theses enzymes to carry out its function as the detoxifying organ of the body. Three compounds found abundantly in wheatgrass help the liver stay vital and healthy. Choline prevents deposition of fats in the liver, magnesium helps draw out excess fats in the liver and potassium acts as invigorator and stimulant. Scientists have known the deodorizing properties of chlorophyll for sometime and this is why some products like chewing gum and breath fresheners contain chlorophyll. Because chlorophyll has the ability to kill odor-producing bacteria, wheatgrass can mask and eliminate the smell of garlic and fights bad breath, body and menstrual odors. Odor-causing bacteria live without air and are destroyed by chlorophyll’s oxygen-producing agents. The cleansing action of fibers in wheatgrass expels retained garbage from the digestive system and promotes regular bowel movement. For fresher breath, gargle with small amount of wheatgrass juice. You can also brush the back of your tongue with a toothbrush soaked in wheatgrass juice. Wheatgrass should also be taken regularly to prevent displeasing body odors. Taking wheatgrass orally and applying it to the skin topically both result to younger-looking and glowing skin. Wheatgrass is abundant in powerful antioxidants like Vitamins C, E, SOD, carotenoids that prevent free radicals from causing damage to the skin. These antioxidants even provide protection from UV radiation. Other vitamins, minerals, amino acids and phytochemicals in wheatgrass stimulate growth of healthy new skin. Chlorophyll promotes blood microcirculation in the skin which is vital in nourishing and cleansing. This results to a glowing rosy skin. Chlorophyll along with other phytochemicals has toning effects which results to a tighter, firmer skin. Applied regularly, wheatgrass can also help fade blemishes and sunspots. Wheatgrass suppresses appetite. A glass of high quality wheatgrass juice can replace a meal. It provides quick energy boost, a sense of well-being and stamina. The fiber in wheatgrass has a bulking effect which gives a feeling of fullness. People taking wheatgrass feel full for a long time, enabling them to lessen the frequency of eating and lessen their food intake. Another reason why wheatgrass can suppress the appetite is that the appetite center in the brain shuts down once the body has managed to ingest all its nutrient requirements. Wheatgrass contains more than 100 types of enzymes that speed up metabolism and help burn fats. It is important to note that as we grow older, these enzymes decline in quantity and strength which weakens the body’s ability to handle fats, proteins and excess calories. Wheatgrass prevents acidity in the body by providing alkaline minerals and chlorophyll. When there is too much acid in the system, the body pushes the acids to fat cells. The more acid there is in fat cells, the harder it is to burn and the harder it is for you to lose weight. Cultivation that's second to none! Easy Pha-max Wheatgrass is cultivated using an award winning Indoor Organic Aeroponic Cultivation(IOAC) – system that’s patented internationally. It ensures you of perfectly clean wheatgrass that is free from bacteria, mold and chemicals. The IOAC system makes all natural variables in the cultivation process controllable. Everything from the lighting, moisture, temperature and natural nourishment is controlled for the optimum growth of our wheatgrass. A special organic fertilizer is mixed with the water system that allows the wheatgrass roots to grow and spread even with the absence of soil, thus guaranteeing clean and healthy roots. IOAC allows us to grow our wheatgrass to its peak nutrient potential. We include the roots in our product for more nutritional benefits. The cold temperature also forces our wheatgrass to produce a phytochemical known as Abscissic Acid which helps prevent cancer. Easy Pha-max is the only company that uses one pound of fresh wheatgrass leaves and roots in every sachet of Easy Pha-max Wheatgrass to ensure that you don’t only get the convenience of small dry sachets for easy preparation and storage, but you also get as much wheatgrass as possible per sachet. With our wheatgrass, you don’t have to hassle yourself with planting your own wheatgrass and juicing it every morning. Most of us don’t have the time or patience to do this. But with Easy Pha-max Wheatgrass, you can take your wheatgrass anywhere and take it any time with a glass of water without sacrificing the quality of your drink. 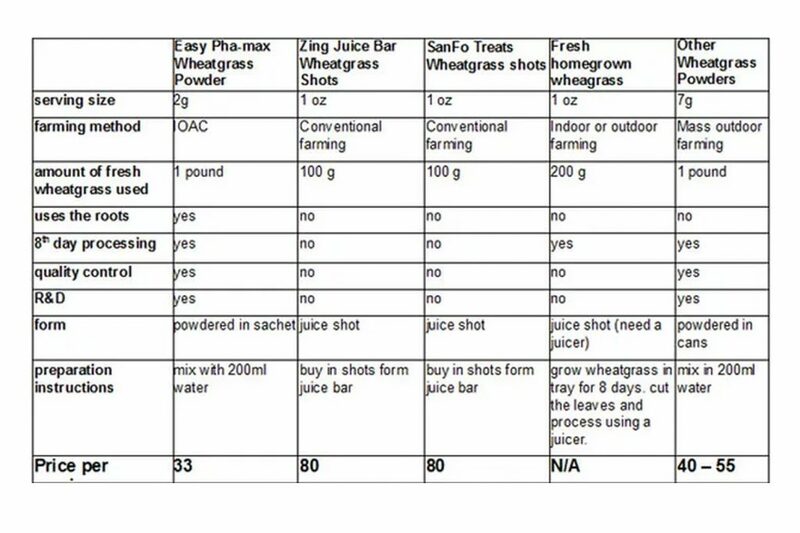 In fact, you get much more from one sachet of Easy Pha-max Wheatgrass than what you’d normally get out of freshly squeezed wheatgrass juice. We have a separate company, Origin Foods, that conducts strict quality checks on all wheatgrass products. A highly automated production process allows for the consistent quality of each wheatgrass sachet. Nothing is left to chance from seed to shelf ensuring that you get the highest quality of wheatgrass with the highest nutritional value in every sachet. The vitamin content of the seed increases tremendously when sprouted. Depending on the seed, optimum vitamin content generally occurs from 50 to 96 hours after it begins to germinate. Sprouts are an exceptionally good sources of vitamins C, B, A and E.
Sprouting produces a powerhouse of mineral activity. Wheatgrain is even more nutritious when it has been sprouted. Its calcium increases from 45 to 72 mg, its phosphorus from 423 to 1050mg, magnesium from 133 to 343mg. Sprouting also gives rise to the formation of vitamin C and activates certain diastases enzymes that were already present in a potential state. (Lifearts, by Evelyn de Smedt et al, St. Martinâ’s Press, Inc., 1977). Antioxidant activity increases in wheat sprouts and young grass as well: these include traces of beta-carotene (Pro-vitamin A), vitamins C and E. Pro-vitamin A supplied in wheatgrass juice is about as much as dark green varieties. (Wheatgrass book by Ann Wigmore). There have been more than a handful of studies showing the powerful effects of wheatgrass with regard to its chlorophyll content, or its ability to hasten the rebuilding of red blood cells. According to The Acid-Alkaline Diet for Optimum Health by Christopher Vassey, wheat sprouts are the highest in chlorophyll of any plant source. From this axiom alone, it is no wonder why Dr. Brad Jensen proclaimed wheatgrass along with green juices as superior to the other blood builders. Wheatgrass cleanses, alkalizes and nourishes your body with every sachet. Chlorophyll in wheatgrass has a similar molecular structure as the blood and can stimulate new red blood cells that in turn carry oxygen to all cells and tissues. It is a powerful anti-oxidant, neutralizing free radicals and detoxifying the blood.